Can you believe that Thanksgiving is only a few weeks away?!? I'm not ready. 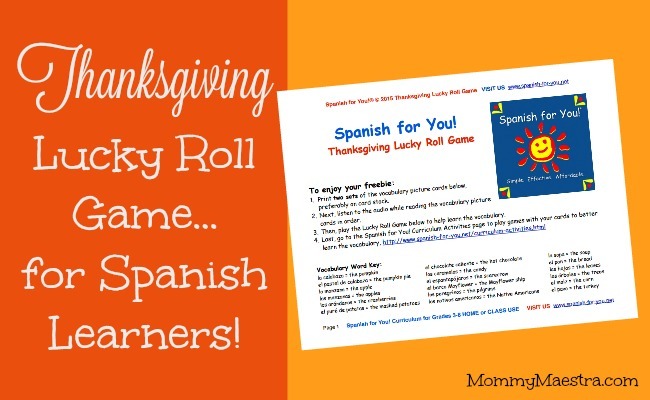 So that's why I'm so thankful for another freebie from our sponsor Spanish for You! Created for Spanish learners, this month's activity helps them learn and practice key phrases used during one of my favorite holidays: Thanksgiving! This is a super fun little game that teaches key vocabulary associated with the holiday. The 9-page download comes with game cards, game sheets, and directions. Not sure of the pronunciations? No worries! It also comes with the audio to help you with the pronunciation of each word. If you haven't signed up for Spanish for You! 's monthly newsletter, you are totally missing out!! Subscribers get the newsletter and sometimes 1 other e-mail per month, only when SfY has something special to announce. Your e-mails are not shared. Sign up here!